Very comfortable mattress, you feel like the only person on the mattress when someone is lying next to you. Highly recommended. If you've had enough tossing and turning for good, your solution is here: the memory gel mattress from BeautyRest. Why? 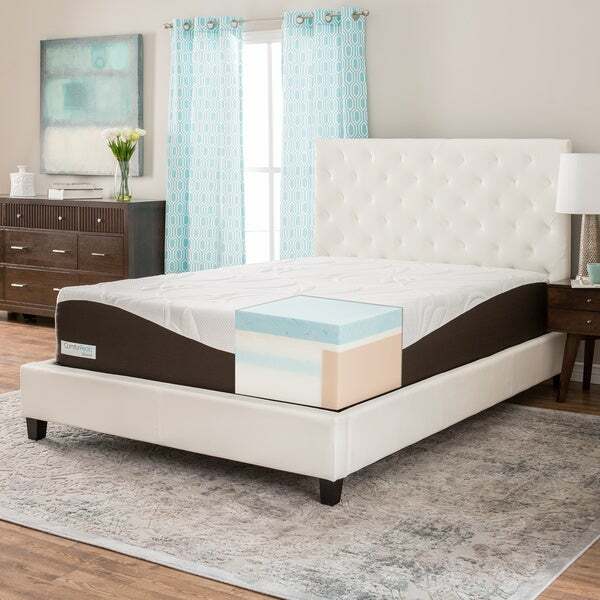 Its AirCool gel memory foam top layer keeps you cool, while four additional layers ensure what matter most for a great night's sleep: comfort and lasting support. Conforming to your body shape, its design relieves uncomfortable pressure points encourages spinal alignment. Arrives tightly packed in portable box for customer convenience. Remove from packaging within 72 hours to maximize expansion. You can sleep on it the same night it is unwrapped; however, allow 48 hours for it to fully return to its original shape. Vacuum sealing sometimes traps odors. After unwrapping, air for a few hours to eliminate trapped odors. Due to machine-cutting manufacturing processes, dimensions may vary slightly. Click here to view the ComforPedic buying guide. Due to the nature of memory foam, the firmness of similar products may vary. Bed frame, foundation, box spring, and bed slats are NOT included. Once opened, this product is non-returnable. Once opened this product is non-returnable. I was looking for a springless mattress, and took the risk on this one. This is one Kool Mat, the way it comes in a bag, reduced to around 4 inches, and then you open it, and it inflates to 14 inches in seconds. WOW! The mattress is as most have reviewed it. It is definitely on the firm side, but there is wonderful hope, if you put an additional 3 inch memory gel foam topper on it, you will be in heaven!! It's a perfect match! Can't beat that comfort level for the money, no way no how! cannot say enough about this mattress. Delivered within a few days. Ready to sleep on within hours. Mild odor from foam which went away later that day. Most comfortable mattress I've ever owned. so glad i purchased! WOW what a bed! It does take the full 72 hours to get the entire air out of the mattress and then it becomes the deep contouring foam I expected it would be. I slept on it the first night it came, thinking ok not bad, then the next night ok a little softer, then the next night I could actually feel the contouring begin with my curved spine getting full support. I never expected to ever be comfortable lying flat again, I had resolved that was just the way it will be, the pain I get laying flat on a bed is forever. I have had spine issues for 20 years and 2 spine surgeries later I was about to give up. I was resigned to always have this horrible pain when in bed. I tried a friends bed and that same night ordered mine. I was worried because I did not do the usual shopping around for the best comfort and price before ordering sight unseen. I trusted Overstock to be able to return this large item if it was not good for me. I truly expected to return it and saved my old mattress for when I had to reuse it. Now my old mattress is gone with the trash and I am surprisingly happy with my choice. I bought the 10-year warranty that was offered for less than a set of sheets. Knowing the maker of this bed over the years "Beautyrest " has a very good reputation and I would not think they would still be in the bed business if they did not produce good products nor would they warranty them. The diagram of the mattress showed how the layers were made and the comfort each layer brought with it. The description did say that the bed would keep your body cooler during sleep but I have not yet experienced that. It's Florida I can hope. I read all the reviews I could from the previous buyers. I read over and over again how this bed was a dream come true for the curved spine, how it gives your entire body conforming comfort individually as needed. I share my bed with my husband, we have had electric lifting beds, water beds, and another off the market brand foam bed that just was not working for me. We put boards under my side of the bed, no difference harder was not the answer. Conforming to my body did the trick. I highly recommend to anyone with a curved spine like mine to give this bed a try, it will be your last brand of mattress, I can not say enough about the comfort I am finally having after so many years never expecting to not hurt again! Not only am I happy with this mattress I am very happy with Overstock for the fast free delivery, the best prices available and the customer service I can always reach if I have a question or a problem. Customer service is more than half a reason a business will survive and be recommended. Overstock has stepped up to the plate. I can quickly chat on my computer with someone within a minute even at this busy Christmas season, I can speak with a representative if I need more information or problem solved or even a live explanation to a question that will lead to another question which can only be achieved with a great customer service team. So Cudoos and 5 stars for the bed 5 stars and Coodos on the Customer Service of Overstock. The company you purchase items from whether large or small must have that 5-star Customer Service to have repeat business and to recommend to new customers. I’ve owned Comforpedic mattresses before that were much more plush than this one. It sinks in about an inch when I lay on it. Not enough for this side-sleeper. I was super hesitant to buy a mattress I had never even laid on but with the price and free shipping and after reading all the glowing reviews I gave it a shot. SO glad I did. This bed is firm in the right places but super comfortable. I don't get too hot either. I am sleeping better than I have in years! I was nervous about buying a bed online without being able to try it. We went to a lot of mattress stores, but the prices for memory foam was always several thousand dollars. We decided to take a risk and buy a bed we had never tried out before with no return policy, and I'm very glad we did. It is definitely a premium mattress for a very affordable price. The mattress is incredibly thick and not only is is comfortable when you first get on, but then you sink in just a bit. I would definitely consider plush firm i.e. I like a plush mattress and really enjoy this one, and my wife likes a firm mattress and she likes it too! Note that you will definitely need to have good support for this mattress and buy deep sheets for it. This item has been a god send. I was sleeping at the most 4 hours a night. since getting my gel memory foam mattress I have 8 hours a night. Love it! I suffer from degenerative disk disease, and this is the first memory-foam mattress I have ever owned. It's amazing to have a bed that doesn't move at all even with pets etc. moving around on the bed. I can go to sleep, and wake up in less pain than I did when I crawled into bed. No agitation for the joints, no bouncing, just sweet solid hug from the bed and unbelievable support. I stayed overnight with a friend and experienced the ComforPedic Memory Foam mattress (old mattress) and it was the reason I went to seek out this bed to purchase. I am SO glad I did. I read the reviews and purchased this because of them. Most said it was the best mattress they ever slept on. Took away back pain the whole nine yards. Well, don't be stupid like I was and purchase any mattress on line that you can not return. This mattress is way too soft, my back ache is worse and now I am stuck paying $*** for a mattress I can not return. Most stores give you a 30 day comfort return policy. This purchase does not. I love Overstock and this policy is from the mattress mfg not them. I was a bit Leary about ordering a mattress without being able to test it out first, but I took the chance and have been thrilled with this mattress. My husband and I are larger people and this mattress is very firm which is important for the both of us, as we both have had back issues. One of the best mattresses we have bought! And with the price you can’t beat it. It was the most comfortable mattress that we have ever had and would recommend it to anyone looking for a new one! I ordered this bed from Sleep Experts and then my husband fought me for it when we separated. Imagine how happy I was to buy it for half the price and get a brand new one! I love this mattress and have given my recommendation to several friends. After sleeping on this mattress for approximately 3 months, we found that it already was beginning soften and lose support. There was major sinking on both sides. My husband was sinking so deeply, it was bothering his back and I, being much lighter was even sinking beyond what one would expect. When contacting the company regarding the warranty, I was told "We have reviewed the information you sent over. It seems your mattress does have a ten year warranty, and I have attached a copy of this warranty for you. The warranty covers permanent body impressions of 25% or greater of the original product height. It seems that it may have a soft spot from laying in the same area. A soft spot may be the beginning of a permanent body impression, though if developed into one, it would be visible and measurable in the photograph. We are not able to see a body impression in the picture you provided. Therefore, at this time the complaint would not be covered by the warranty." We have already purchased another mattress, as we can't sleep on this mattress until you can see a "permanent body impression". Anyone want to buy a mattress? I am 150 lb and I would say this mattress comes in as not too firm and not too soft. I could see if you weigh a lot and prefer something more firm, this may have you feeling like you're sinking in. But to me it feels quite good. When I first got the mattress I had to adjust for about a week, getting used to the feel, but now I would say it's definitely better than my old mattress which was indenting in the areas where I slept the most. Also, this could help with low back pain if you suffer from that, since the foam helps support in areas where older mattresses don't. Quality seems good and everything was as expected, now it's just a question of whether it lasts. This mattress is the best mattress I have ever purchased! I've spent far more money on a mattress only to have them sag, flatten, lose shape, etc. This mattress does not do any of those things AND it's like sleeping on a cloud that softly hugs you the entire night. I have never slept so well! We now have 2 of these matresses and we couldn't be happier or more well rested! Worst purchase of my life. It got hard within the first year. I can’t sleep every part of my body hurts with this mattress. Don’t buy it you will regret it! Arrival was slow. The mattress is comfortable overall, but is on the softer side for my comfort preference. Doesn’t knock it out of the park or anything. I was hoping this mattress would be cooler to sleep on and more comfortable than our last one. It took some getting used to and it's sturdy, meaning it doesn't move around when my husband moves around. It isn't great, but it's ok.
My husband loves this mattress and I hated it. It is very firm and I felt like I sunk in and couldn’t move. He had relieve from back pain and I had it created. First mattress was defective- the company was great about replacing the mattress. We love our new mattress - super comfy - now everyone in the family wants one! It’s great if your spouse is a restless sleeper - you do not feel the movement. Super happy I ordered! So happy with my purchase.. takes a little bit to get used to but no other mattress compares! Have recommended to many friends! My husband and I spent countless hours trekking to several mattress stores only to be left confused. We decided to go out our comfort zone and ordered this mattress and are so glad we did! It arrived all rolled up in a big box that did require 2 people to move. Our biggest recommendation is watch the video on how to unpack it and place it on your bed. It was quite amazing to watch it “grow” once out of its package. It’s very comfy and love the cool gel aspect. Definitely would purchase another one. A couple things.... We tested mattresses for about a month at several places and decided to try this because of reviews and price. This is no way plush or soft...I would consider it a medium. Terrible if sleep on your side or have a bad bad back. On a different note...I called in to ask how much what it would cost to ship back figuring it would not be free (before ordered). She let me know and It was a decent price for a big item. Well, two weeks later I went to return it and it states no returned! Get things in writing because we are out $ and we asked.. This is my 1st bad experience with this company so I’m hoping to still resolve this. If they do I will update my review letting people know if they stand behind there products. So far Very sad and disappointed. "Is this the same mattress that comes in the “set” for sale? This one says “medium” and the other says “plush”. Yet they are both 14 inch gel memory foam mattresses by comforpedic. " This mattress is part of the same collection as the mattress & foundation set, however these two products have different firmness levels. The mattress set you are referring to is "plush", while this mattress is "medium". "is there a manufactures warranty?" "What is the density of the foam? And, is this mattress plush, firm, medium? Description doesn't answer either question." The density used is proprietary information. This mattress offers medium support. "How firm are the sides? When you sit on the side dose it sink or hold its shape"
This mattress is designed to hold its shape when sitting on the sides, however it is dependent upon the amount of weight. "Is there a weight limit for this mattress." "What box spring should I get for this mattress?" Any standard box spring will work, or if you have a platform style bed, you will not need a box spring. You don't need a box spring. It works better with a platform bed. "Does it come with a box spring and the metal piece to hold it up? or is it just a really expensive rolled up mattress that you have to buy the two other parts?" Most mattresses don't come with a box spring. Also, this is a relatively cheap mattress compared to others with similar specs. BeautyRest mattresses can go upwards of $5k+ for a King. FAQs about California King Mattresses from Overstock.com. Our guides provide customers with answers to frequently asked questions about California king mattresses. The biggest difference between a king size bed and a California king bed is that one bed is shorter and wider, while the other is longer and narrower. A king size bed is 76 inches wide and 80 inches long. A California king is just a few inches narrower than a king bed at 72 inches wide, but it’s longer at 84 inches. Let us walk you through the pros and cons of each mattress size and get thinking about what to consider before you make your final purchase. Industrial Design is for the ones who thrive in busy cities and urban jungles. You live for the early-morning moments overlooking the cityscape, as well as the hum of city nightlife. You are the city, always on the move and embracing everything the world has to offer. Find Boho Chic decorating ideas for your home. Shop our huge selection of Boho Chic furniture and decor at Overstock.com. For the decor enthusiast who strives to use it up, wear it out, make it do, or do without, Shabby Chic is your cup of tea. Whether you prefer a terraced house in a misty London borough or a whitewashed cottage tucked into a rural hillside, this type of decor is beloved for celebrating the beauty of aging objects that transform a house into a well-loved home. It's all about a collection of the things you love in a space you adore. There’s a ton of different foam mattresses on the market, but two types that often get compared are latex foam and memory foam. While each definitely has its own strengths, you need to choose the right mattress for your specific needs. Which mattress will your kids prefer to pile on during the weekends? Will latex or memory foam help your significant other’s back pain? We’ve broken down latex and memory foam mattresses into five important categories to help you find the perfect fit for you and your family. When it's the middle of the night, the last thing you want to deal with is someone wetting the bed. But hey, accidents happen. Whether the tinkler was your kid, your pet, or (shhh!) yourself, don't worry — we've got your back. Follow these easy, no-fuss steps to clean a urine stain right out of a memory foam mattress. Make sure to do steps one through six before you go back to bed. It may sound like a pain, but we promise it’s worth it. Need a general guide to memory foam mattress care? Read our guide on How to Clean Memory Foam Mattresses. Looking for the best memory foam mattress for you? We’ve got you covered. Replacing your old, worn-out mattress with a new memory foam mattress is a quick way to finally get the deep, restful sleep you need. Memory foam is a thick, ultra-supportive material that conforms to your body as you sleep. It cradles your body in every position, providing extra cushioning and comfort for your hips, neck, and shoulders. If you’re ready to upgrade to a more luxurious and supportive sleeping experience, a memory foam mattress might be just what you need. Keep reading to learn everything you need to know before purchasing a new memory foam mattress. Coughing, congestion, and labored breathing are occasional cold symptoms for some but if you have evening allergies, these can be nightly sleep disruptions. Allergy symptoms tend to peak at night, making your sleep restless and your days exhausting. Sick and tired of feeling sick and tired? Swapping out your musty old mattress for one of these hypoallergenic options will have you resting (and breathing) easy once again. Your bed should be a welcome, comforting retreat when it is time to get quality sleep. Whether you will be upgrading from a twin to a full or you need a larger bed that offers sharing space, learn the facts about every bed size out there. Reclaimed Wood and Cement. Marble and Metal. Leather and Wood. These materials didn’t used to be mixed but now they've come together for a winning combination. Capture the enchanting aura cast by red rock and turquise stone in home furnishings and decorative accessories inspired by the American Southwest. Mattress Sets are non-returnable upon signature at delivery. Mattresses are non-returnable if opened or taken out of their plastic wrapping.